Hmm, I think I saw you as an author making a pull request, but I didn't get the changes you made. Could you try again? 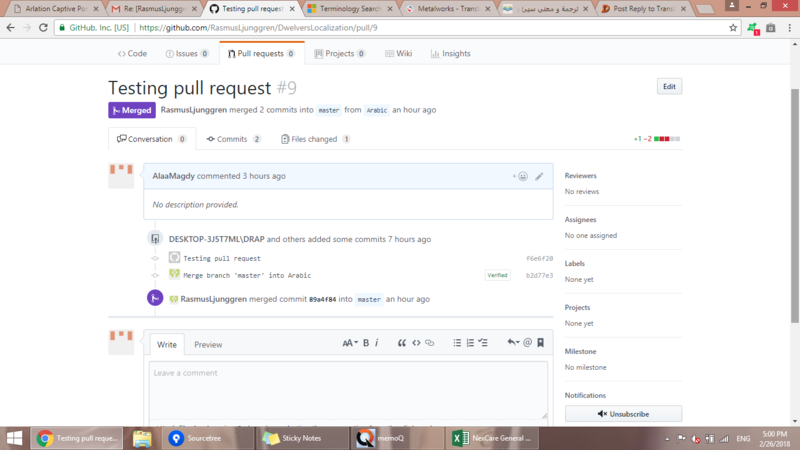 (26-02-2018, 03:41 PM)Rasmus Wrote: Hmm, I think I saw you as an author making a pull request, but I didn't get the changes you made. Could you try again? @Rasmus - I fixed links to images of Alaa's posts, so if you haven't already check out the previous Alaa's messages. @Alaa - when you copy link of image be sure you clicked "show image" option before and than from it copy image URL, otherwise image won't be displayed properly. PS. I see you also wondered how to translate "Metalworks", it's a weird word. Sounds all different from the steps I went through. I copied the English folder, pasted it and renamed it with "Arabic" instead". I started to translate then tried to update the Arabic version on Source tree. I press Push but then I get this pop-up to type my Github email and password, I do so then it gives me "Access denied". I tried the steps advised by Rasmus as well... I am not sure where I went wrong. As for "Metalworks", I think it has to do with forging metal. Most likely the place where metal is made to objects and so on. So when you suggest to upload a file to localization on GitHub and than do a pull request either on website or via application you get access denied? Have you tried just to use GitHub website only to create new file, paste your translation there and pull request? This is how it worked for me. (27-02-2018, 09:59 PM)Sebt Wrote: So when you suggest to upload a file to localization on GitHub and than do a pull request either on website or via application you get access denied? Thank you Sebt . I tried uploading the file on Github as you recommended but it gave me this message: File uploads require push access to this repository. So, I am not sure exactly. Have you got any idea about the deadline? I don't know about any deadline, but I think Rasmus wanted to release new version or the next after it with localizations included. GitHub Wrote: You’re creating a file in a project you don’t have write access to. Submitting a change will create the file in a new branch in your fork <username>/DwelversLocalization, so you can send a pull request. There are only two steps needed to suggest a file or update to a file where one i creating or updating a file and the next is pulling request and than you just need to wait for Rasmus to submit it. To do this after you create, name and put description of a file (recommended) and click on Propose File, the last thing to do is to find a button above that says "Pull request" - only in this way your file will appear on GitHub in "Pull requests" bar, so Rasmus could see it and than approve it. The window where you can pull request would look like here (there is also a link to create pull request in different way there). Well, if you encounter any issues again I think you can just upload a translation here in this forum thread. Hello everyone! I spoke with @Rasmus about doing the Romanian Localization. I did play the Demo Version for a while, and I must say, it's a pretty addictive game. Started localizing it, we shall see how fast it goes. Oh, that is pretty nice ^^. I've checked all the posts in the thread and almost everything is fixed (except translation for the launcher). I thought it was weird that some stuff was not showing up although I knew they were translated. I noticed this while tinkering with the editor, and I'm just going to describe the needed change since it would apply to the game's hard code I believe. Check references to line 9, and modify the ID to be length instead of height like it shows here.